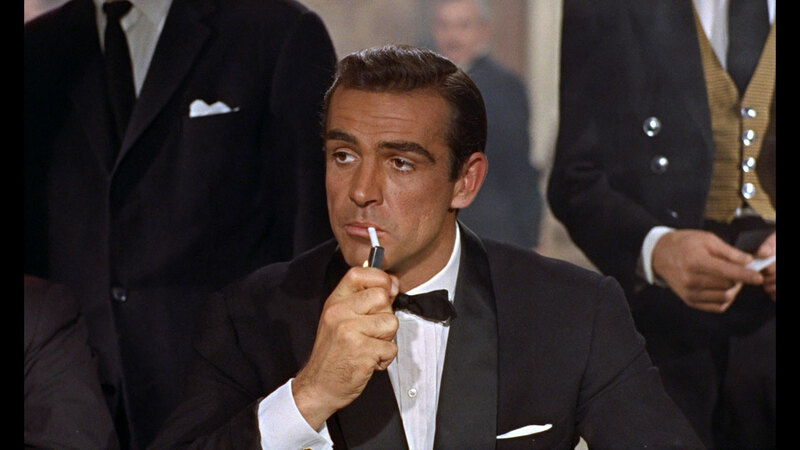 Dr. No is not an ‘origin story,’ but it is an absolutely perfect introduction to Bond’s cinematic persona, as various unforgettable scenes demonstrate why this man isn’t merely a secret agent to be reckoned with, but an iconic, endearing fictional character for the ages. The film interprets the character more playfully than Fleming’s original work – with a clear element of tongue-in-cheek spoof firmly in place from the start (which would, of course, get out of control down the line) – while still capturing what a deadly, intimidating, and intelligent character the author created. Later films would eventually push the parody aspects too far, in an increasingly cartoonish direction, but Dr. No achieves a wonderful ‘best of both worlds’ balance. It has plenty of fun with Bond and his chauvinistic, womanizing ways, but when the time comes for him to leap into action, he leaps with vigor. When he carefully secures his hotel room, or quietly prepares to greet an assassin, or coolly deals with a team of hit-men upon arriving in Jamaica, we quickly get a sense that this man has led a dangerous life, and learned to navigate it with precision. I love that Dr. No affords Bond all those subtle but crucial opportunities to show his skills; as ‘classic’ Bond goes, this is exactly how I like to see him portrayed, and Dr. No’s handle on the character is nigh flawless. Sean Connery is, of course, perfect in the role, instantly iconic and effortlessly compelling. We shall talk a lot more about his work as we move through these early films, but for Dr. No, it is important to mention just how easily he slips into the part, and how much tremendous non-verbal work he does. Connery’s voice is famous for good reason, but his interpretation of Bond relies just as heavily on body language and facial expressions. Consider the initial briefing scene with M; Bond doesn’t say anything out of the ordinary, but Connery’s face suggests fascinating hints of vulnerability, as though Bond is, if not reluctant, a wee bit intimidated by a man even colder than he. Brilliant work, and Connery only gets better and better as the film moves along. 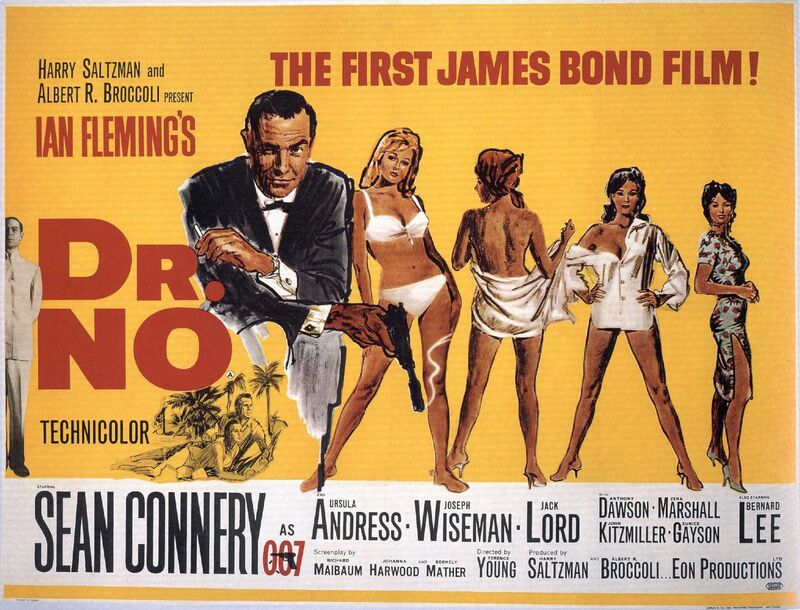 The story of Dr. No is not particularly inspired, though it makes excellent use of the Jamaican setting and gives Bond some quality detective work to do. The characters are the appeal here, providing Bond with fun personalities like Jack Lord’s Felix Leiter or John Kitzmiller’s Quarrel to play off of. As Honey Ryder, Ursula Andress is certainly one of the most stunningly gorgeous Bond women, though the character herself is fairly goofy. She just sort of stumbles into the film out of nowhere – with Andress’ voice entirely dubbed over by another actress, a symbol of how, in the early going at least, women were merely physical ‘accessories’ for 007 – and while hints of a dark, intriguing backstory are given, the film does not explore her psyche in any significant way. That’s arguably a shame, as there is some very interesting material to play with, but as female characters go this early on, we must take what we are given. That Honey is allowed to be strong and independent to any noticeable degree is a small victory, and it says something that fifty years later, she remains one of the most memorable Bond girls. Dr. No himself is a fairly dry villain, but Joseph Wiseman plays him quite well, and his death is suitably satisfying. The doctor’s motives are a bit hazy and confusing – I have seen Dr. No many times, and always forget what his actual plan is when I revisit it – but the film builds to a quality climax, where Bond saves the day not with a major action set piece, but with a smart sense of restraint and timing. It is far from the most thrilling Bond finale, but a perfectly fitting capper for a more laid back adventure. 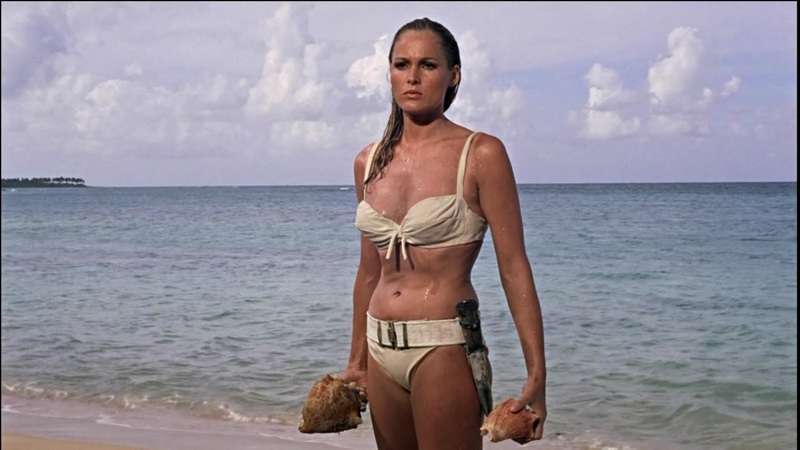 Visually, Dr. No is a startlingly beautiful film. Production Designer Ken Adam, one of the most important names in the entire James Bond production canon, was afforded over a third of the film’s modest production budget (roughly $1 million), and every penny is up there on screen. His work is utterly unique, a bit unlike anything contemporary audiences had ever seen, at once modern, fantastical, and quite often intimidating. 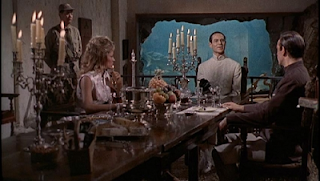 Dr. No’s lair – including the rooms Bond and Ryder are kept in, or the pipes 007 crawls through to escape – is one of the great feats of design across the entire series, and combined with Ted Moore’s absolutely gorgeous, European-style cinematography, Dr. No is a visual treat from top to bottom. I find every frame of the film entrancing, and while the action choreography is nowhere near at the level it will eventually rise to, stunt coordinator Bob Simmons already begins to show what he and his team can do with the few (but impressive) number of fights and set pieces present. Special mention should also be given to Monty Norman’s musical score, of course. He over-relies on the James Bond theme itself (orchestrated and arranged, it should be noted, by the series’ most notable musician, John Barry), but I still really like his work here. It has a nice, off-beat character to it, a little unlike anything else in the series (this is the only entry Norman scored), and completely fitting with the material. 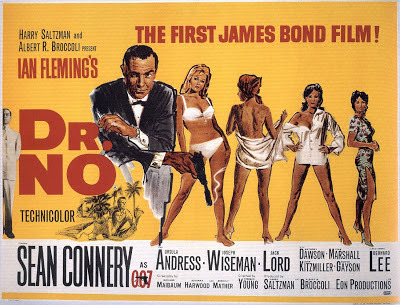 The James Bond series would immediately reach bigger and better heights, considering what a tremendous triple-punch From Russia With Love, Goldfinger, and Thunderball were about to provide, but Dr. No is nevertheless a wonderful, if smaller-scale, James Bond adventure. Smart and suave from beginning to end, it remains one of the most enjoyable, unabashed pleasures in the entire series. Familiar with Dr. No? Have thoughts to share on this week’s film? Please do! Sound off in the comments with your thoughts on the first James Bond picture, and come back next week to share your take on the second!